And just typing those words brings tears to my eyes. It happens every time I watch that scene. I cry and cry because of that unmistakable bond between a boy and his dog. It’s something you can’t know until you know it; much like motherhood. Today, my boy turns two years old. My little baby boy, is no longer a baby. He is ALL boy too and so vibrant and joyful. I can’t believe it has been two years, yet it’s only been two years. Having Oscar has changed our lives and our hearts. At two, Oscar is counting to ten, singing the abc’s in the middle of the night when he can’t find his paci and constantly asking to watch TVV (not sure where he gets the extra v). 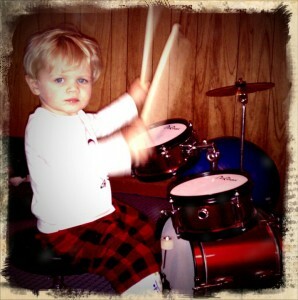 He loves to play at the local children’s museum and is still 100% enamored with all things drums. My boy has rhythm. He is smart, funny and an absolute joy to be around. When he does something wrong and I correct him, he says ‘Tine out?” and sits in the middle of the floor. It’s only when I agree that yes, he will be having time out that he protests. But when the timer dings and we talk it out, he says kiss? hug? And we make up and move on. He’s already broken a leg, but surprised us all with his amazing resilience and capacity to take it in stride. In fact there isn’t a day that goes by that we aren’t thankful that he is in our lives. We are so proud of you Oscar. Our boy. Awww! *tear! Happy 2nd Birthday sweet Oscar!!! What a cutie, and what an adventure for you! Happy birthday to Oscar! Happy belated birthday to the little guy!